Fish got her start as a teenager sneaking into Knuckleheads Saloon -- a local blues joint in her home town. Before long, the budding guitar player was sitting in, jamming, and getting attention. More eyebrows went up with the release of "Live Bait," which got her onto Ruf Records and on her way. Flash forward to today: Fish just released her third studio album, "Wild Heart." A slightly more roots rock affair in spots, this Luther Dickinson-produced album is a terrific study in blues and blues-affected music. But you've got to dig Fish all the way live, where she is a major-league barnburner. It's beautiful ... and ugly. City Newspaper shot a few questions Fish's way. She shot back some answers. Here they are, Jack. An edited transcript of that conversation follows. City: When did you first hear the blues? 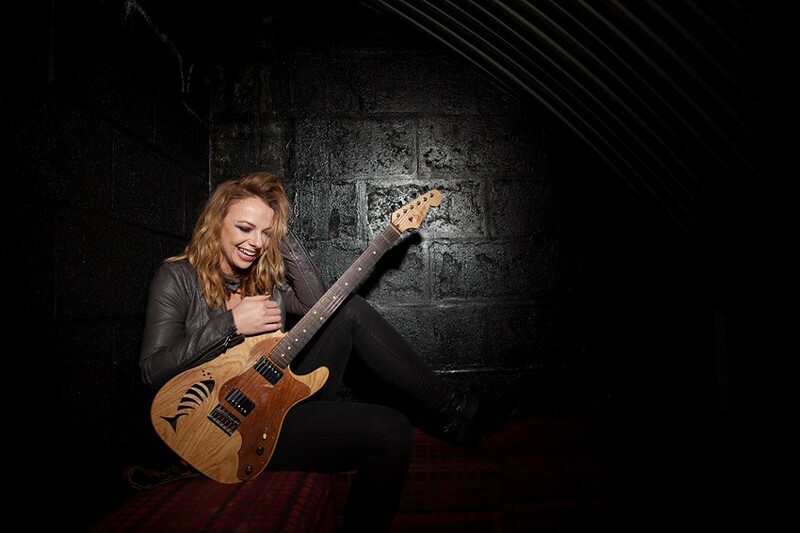 Samantha Fish: I'd been hearing blues all my life, but it was never a focal point until I was a teenager. I really connected with live performance, and that's where the blues caught me. I felt the passion and the honesty. That drew me in immediately. Being able to watch someone lay it all out on the stage is incredibly inspiring. How long until you started playing blues? I don't remember exactly when it became the major focus; sometime in my late teens. How do you, as a young woman, relate to the genre? I relate to the passion and honesty in the delivery. The storytelling, the true connection to the heart; there is something so real that strikes a nerve in me. That inspires me to play and write my own music. What are some of your obvious influences? Rock 'n' roll has played a huge part in my development as a musician. I always talk about The Rolling Stones, Tom Petty, Zeppelin. I was also attracted to the gutsy, raw delivery of North Mississippi, performers like Junior Kimbrough and R. L. Burnside. I think they really bridged the gap from rock to blues for me. What are some of your not so obvious ones? I grew up listening to country and Americana singer-songwriters. I'm a huge fan of John Hiatt, Buddy Miller, Townes Van Zandt, etc. I love country and Southern rock. Are you a singer that plays guitar or a guitarist who sings? I started doing both at the same time. I can't remember if I started playing as accompaniment to my singing, or if I started singing to act as a tempo or "place holder" for my guitar. When I started writing, the song and voice became the most important thing. I still don't feel right without something in my hands though. Talk about the making of your new record, "Wild Heart." How does it compare to your previous releases? It was my first time working with a new producer, and Luther Dickinson filled that role. We recorded in four different studios, but did the bulk of it with Brady Blade at Blade Studios in Shreveport, Louisiana. I also worked with songwriter, Jim McCormick, out of Nashville. He co-wrote five of 10 originals with me. It's my favorite record to date. The songs are truly from the heart and I feel like that translates throughout the album. It's my most honest and mature music yet. What was it like working with Luther Dickinson? Luther is amazing. He's so creative and talented. He knows his way around the studio because he grew up in them. He's brilliant on the guitar, but he's also got this great intuition when it comes to coloring a certain mood of a song. I was thrilled to have the opportunity to work with him, and I feel like I grew a lot. He really pushed me to be myself and say exactly what I wanted with this album. Some reviews have said "Wild Heart" is more roots rock than blues rock. Is this a direction you're going in? I definitely challenged myself with this album. In the past, I might have stifled an influence or a song because I felt like it wouldn't be accepted in the blues world. Some people are calling it blues; some people call it Americana; some are calling it roots rock. I think it's impossible to deny that the blues will always be an influence in my writing. In regards to the future, all I can say is that I'm working toward finding myself and honing my sound. I just want to make good music that people want to hear. I know "Wild Heart" just came out, but what do you think the next record will sound like? There is still a lot of room for growth and change by the next album. I am already writing, but I don't have any concrete spoilers yet. In your relatively brief career, what are you most proud of? I've had a few accomplishments that I'm proud of. Beyond any one moment, I'm most proud of the progress. It's an incredible feeling when your music starts to catch on. Sometimes I see people at shows singing along with my songs. Music gave my life purpose and a narrative long before I knew that was going to be my profession. Having the opportunity to affect others positively through music, that makes me very proud.